Today we’re thrilled to introduce you to two of our favorite people on the internet, Kelly and Jeff Mindell. Kelly is the creator of Studio DIY, a blog that covers party decor, pop culture-inspired DIY projects, zany costume ideas, and all things rainbows and unicorns – literally. Jeff is a leading photographer who shares all things colorful and SoCal inspired on Instagram. The color-loving couple has had quite a busy year – buying and renovating their first home and becoming parents to their adopted baby boy, Arlo. When Kelly and Jeff first stepped foot in their home (now dubbed #themindwelling) it was love at first (arched doorway) sight. The place needed a lot of work, but these two creatives could see the potential behind crazy trim colors and a wacky kitchenette off the bedroom. One thing that stuck out like a sore thumb was the mismatch of crazy window coverings from the previous owner. As they started shopping for alternatives, Kelly and Jeff knew they wanted shades that would give complete privacy, let in lots of light, and blend into the window when raised. Finding something without dangling cords was also a top priority since little Arlo was starting to walk and explore. Although their style is bold and colorful, Kelly and Jeff decided to keep all the baseline features of the house, like windows and walls, a clean white. This allows them to layer on bright accessories and update as inspiration strikes. After working with Blinds.com Designer Dixie, they landed on Premium Light Filtering Cellular Shades in Moonlight with a Cordless Lift for the whole house. Kelly is detail-oriented when it comes to color (in the best way possible!) so she and Jeff made sure to order free fabric samples and compare colors in person. Choosing a cordless lift for the cellular shades means that there are no accessible cords for Arlo to play with. Plus the windows get a clean look and are easy to adjust. Are you shopping with a little one in mind? Check out our guide to safer window treatments. Matching blinds can certainly do a house good, but the color-riffic rooms that Kelly + Jeff have revealed so far do anything but blend into the background. Check out these before and afters, and click through to see the full room reveals! 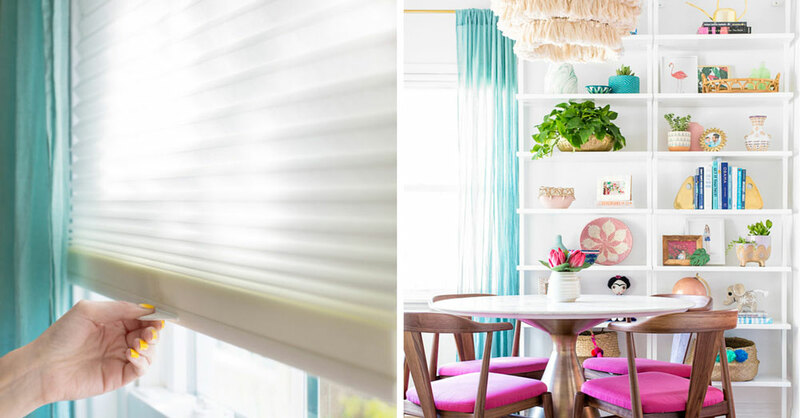 See the full dining room reveal and get Kelly’s tips for picking the perfect blinds. Master Closet Reveal – Can you believe that this used to be a kitchenette off the master?! Arlo’s Nursery Reveal – You’ve got to see this rainbow bookcase! Kelly and Jeff gave their whole place a uniform look with Premium Light Filtering Cellular Shades in Moonlight with a Cordless Lift. All photos courtesy of Studio DIY and Jeff Mindell. Previous Article Is This Window Treatment Mistake Ruining Your Curb Appeal? This is a test comment that can be deleted. Thanks for sharing the amazing guide the post is very helpful you have an amazing arrangement all the things are looking perfect. I love the blinds.